Naïve web developer Parker Bell joins the IT department of a large credit union thinking he's found his dream job. Unfortunately, he quickly realizes things are not as they seem. Shocked at what he discovers about his new colleagues and the lax procedures at the credit union, he grows increasingly disillusioned and leaves after just two and a half months on the job. His former boss is later fired and he is called back to lead a team of consultants in cleaning up the mess she left behind. The police are then called once he makes a horrifying discovery of what had been going on behind the scenes, setting the stage for a dramatic conclusion. 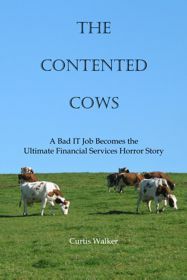 A must-read for IT professionals and anyone in the financial services industry. Click here to purchase the paperback edition and here to purchase the electronic edition.